Why is miscarriage shrouded in secrecy? I’ve said it before and I cannot believe I am saying it again. Why is having a miscarriage something people pretend never happened? Or worse, why are people judged so harshly after having had a miscarriage for not embracing any subsequent pregnancy and being a little bit cautious and tentative about the whole thing? Yesterday I read an article on some random website announcing that a celebrity had just announced she was pregnant. The article was extremely critical of the fact that she had waited until the 6th month to announce her pregnancy, and commented that it may have been due to the fact that she had suffered a prior miscarriage. It then went on to discuss all sorts of celebrity pregnancy issues. But it was about the third article I have seen recently commenting on a celebrity’s miscarriage. None of the articles were supportive, not even for the one celebrity that was openly going through fertility treatment and then lost a baby. Any miscarriage at any time in pregnancy is awful. As many of you know my final infertility diagnosis was unexplained pregnancy loss (which has since been explained). I had 5 IVF miscarriages (including a pregnancy that started as twins), and I don’t want to tell you how many more I have had on top of that because at some point you just have to stop counting and cope. I have blogged about at least one of them. I have always been open about my miscarriages and my pregnancies. I am one of those “put it out there” kind of people. But a lot of people choose not to share early pregnancies. They instead choose to wait to make an announcement when they are sure that the pregnancy is viable or the fetus is otherwise healthy. Everyone does it their own way. And as this is a very personal subject, I was offended that this article “accused” this celebrity of failing to disclose her pregnancy earlier. MYOB! Miscarriage is poorly understood on so many levels. I will blog about the medical aspects later, but for today let’s address the emotional component. I may have blogged about this before but someone recently commented to me that 20 years ago no one even talked about this. My grandmother’s generation suffered in complete silence, often not even sharing the loss of a pregnancy with their spouse!! The fact that we are beginning to talk openly about miscarriage is a huge leap forward. Did you know that among the fertile population only 20% of all conceptions result in a live birth? That number decreases with age. With so many women choosing to build their families later in life, whether they conceive on their own or with some form of medical assistance, their chances of experiencing a pregnancy loss are much higher. Doctor’s often warn patients who are over 35 not to get excited about a pregnancy until they see a heartbeat on ultrasound because the risk of miscarriage is so high. NOvary™ or not, miscarriage is devastating. If you ask me, all these women need support, information, and the ability to discuss their grief in whatever manner is most appropriate for them and to do so without criticism! But the fact remains that most people still won’t even admit they had a miscarriage. The entire first trimester of pregnancy is shrouded in secrecy and thus any resulting miscarriage is as well. It is not a personal failure to lose a baby. It is an overwhelming emotional experience whether you are six weeks or six months pregnant. I think people should be able to talk about miscarriage — I think people need to be better educated about pregnancy loss but as noted that is a subject for a different blog post — and not have it be considered something shameful or even worse, “no skin off your nose dear, you were only 7 weeks pregnant, get over it”. Is it the fear of being shamed that causes us to hide our miscarriages as was true for my grandmother and her generation? Is it the need for privacy and the accompanying silence during the first trimester that causes the secrecy? Or is it the fear of the “just get over it” response that people don’t discuss this topic? Well, I am going to discuss this topic. I think I have enough experience to have some insight into the emotional aspects of pregnancy loss and I’ve done a ton of research on the topic, both for The Infertility Survival Handbook, my own personal curiosity and now for the revised and updated version of my book. My final comment of the day is this. Whether we choose to grieve in silence or in public, please don’t attack us for our choice in so doing; you need to understand that it is a tremendous blow to every woman (not to mention her partner) who experiences a pregnancy loss. If you know someone who has shared this information with you, BE SUPPORTIVE. I was dropping my son off at school recently and there is church nearby where I had parked my car. Alongside the church is a beautiful garden and in that garden there was a headstone that caught my attention. 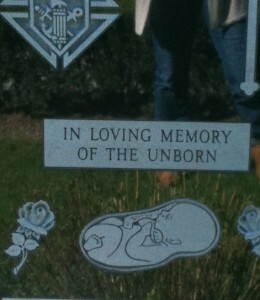 It was a headstone with the picture of a baby in-utero and it was dedicated to all the unborn children in the world. The headstone had the name of a baby who died in utero at about 5 month’s gestation. It wasn’t some pro-life stunt; this was a real headstone for a real fetus who died leaving a family devastated. If I can do it, I will try and post a picture of the headstone (without the family’s name). I would like to thank that family for putting that headstone there and for the church for allowing it, because I now have a place to go and lay flowers on my “bad” days. Because frankly, my girlfriends don’t get it. This headstone gives me an outlet, a place that recognizes what I and so many others have been through. And for those of you who have experienced a pregnancy loss you have my empathy and a giant cyber hug. To that celebrity who just announced her pregnancy at 6 months, you have my congratulations. To that cyber author, I can’t post what I think about you, but I do hope that you never have to endure what so many of us have been through.